Our first W.Y.O.S.T. 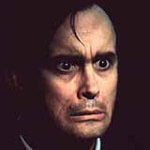 subject is one of my favorites, Jeffrey Combs. Who, appropriately enough, is somebody who actually was on a Star Trek show. Several of them actually. In fact, he holds a number of records in that department. 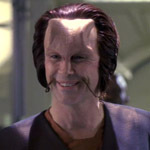 He’s had recurring roles in three of the Star Trek shows — Deep Space Nine, Voyager, and Enterprise — and is one of only a small handful of actors to play seven different characters in the franchise, appearing in ten seasons and 43 episodes overall. What’s more, he’s one of only two actors who have played three different characters in a single season, as well as two unrelated characters in a single episode. All because he originally auditioned for the role of Riker on The Next Generation. But Combs’ sci-fi resume is definitely not limited to Star Trek shows. 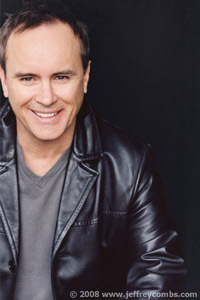 A professionally trained actor, up until he moved to Los Angeles in 1980, he pounded the stages doing Shakespeare. 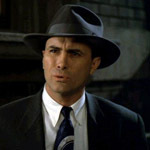 To date, he’s clocked in well over 100 movie and TV appearances. 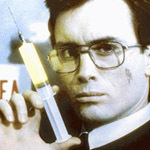 My first exposure to him was in 1985, when he played the insane and hilarious Dr. Herbert West in the classic B-movie Re-Animator, which my brother and I videotaped off of cable and must have watched a thousand times. The movie was based on a story by horror writer H. P. Lovecraft, and would actually form the first relationship that Combs had with a franchise. He would go on to feature in a handful other Lovecraft-based flicks — From Beyond, Bride of Re-Animator, Lurking Fear, Castle Freak, Beyond Re-Animator, and (coming soon) House of Re-Animator — and even got to play Lovecraft himself once, in 1994’s Necronomicon. Besides a laundry list of horror B-movies — including a memorably creepy appearance as Dr. Vannacutt in the 1999 remake of House on Haunted Hill — Combs landed a role in Peter Jackson’s The Frighteners, and acted alongside Renee Zellweger in Love and a .45. 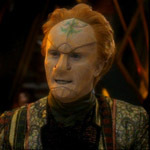 If you’re a Babylon 5 fan, you probably spotted him in a role as Psi Corps Agent Harriman Gray back in 1994. But until 2005, the bulk of his sci-fi work occurred in the Star Trek shows. 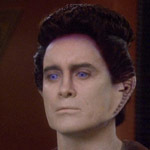 On Deep Space Nine, he played an alien who stalked Major Kira, a Ferengi liquidator named Brunt, a 1950s cop in one of Sisko’s visions, and five different cloned versions of the Vorta diplomat Weyoun — the role that Combs himself considers his favorite. 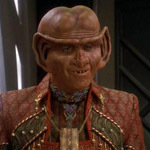 On Voyager, he played a bloodsport promoter and a Ferengi pirate. 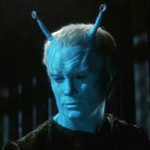 And on Enterprise, he was outstanding as the blue-skinned Andorian Commander Shran — a role for which the producers claim they would have made him a regular cast member, had the show lasted one more season. In 2005, I was happy to see Combs introduced as Dr. Kevin Burkhoff in the second season of the sci-fi series The 4400. Most of his scenes put him alongside Firefly‘s Summer Glau, and the ongoing role turned out to be pivotal to the mythology of the series. As of the final episode before the series’ cliffhanger cancellation in 2007, Dr. Burkhoff was still alive, and had essentially just saved the day. Many fans still hold out hope that USA/NBC will cap off the series with a more satisfying finale, perhaps in TV movie form … but so far, there seems to be no indication that this will happen. Fortunately, it’s not keeping Combs down — he’s listed in no less than seven roles on IMDB.com for 2008/2009, most of them horror movies, and I suspect we’ll see his face in a sci-fi role again soon enough.